The monstera deliciosa sits upright on your counter, molting its leathery hide from the top down as the days go by. It's no lizard, but an amazing fruit that will have you drooling. Though shaped like a cob of corn covered with green hexagonal scales, and with interior kernels of fruit that are very similar in appearance to corn kernels, early European explorers of Central America got a nasty surprise when they tried biting into the delicious monster. The unripe fruit is so full of oxalic acid that it is poisonous, causing blistering, swelling, itching, and loss of voice when consumed. It takes a full year for the fruit to ripen, but even then it's surprises are only beginning to unfold. 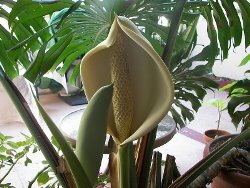 I remember buying a monstera deliciosa from a Jamaican in southern Florida. How, I asked him, would I know when I could peel it? "No mon," he told me. "It's gonna be peeling itself." With a line of fruit buyers behind me eager to check out, I turned away befuddled. Was this some sort weird Jamaican philosophy, I wondered. It peels itself? A friend soon explained how it works. You stick the fruit, tip down, into an empty glass and wait for it to peel itself from the top down. As the outer skin comes off, the corn-like kernels surrounding an inedible central husk are revealed. 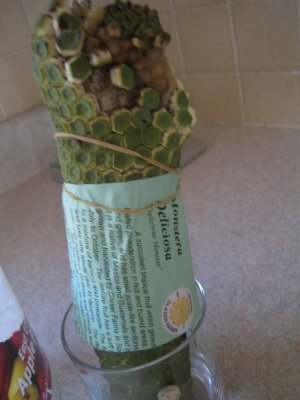 Eating monstera deliciosa is a bit strange, and slightly frustrating frankly. The few I've had are never ready to eat at one time. The scales come off a bit at a time, so you can literally take a few bites out of it every day for a week but never just sit down and devour one. They're like some sort of bizarre Buddhist patience exercise. However, the taste of the Mexican Breadfruit, as it is also know, makes your patience worthwhile. The whole thing emanates a sweet perfume, and the kernels have a custard-like texture that tastes like a mix of a banana, pineapple, and just a hint of mango. The delicious monster grows naturally in rainforests from Mexico to panama, but has been successfully propagated in southern Florida and other tropical locations. The plant itself is called either the split-leaf, windowpane, or ceriman. The leaves are poisonous, but very beautiful. They can be grown indoors, and started becoming a popular houseplant in England in the 1750s, though they won't produce fruit indoors. Though it originally has a root system in the ground, the plant will start moving towards the nearest tree and start climbing, eventually shedding its roots and heading upward toward the top of the canopy and sunlight. Read about other exotic fruit here. 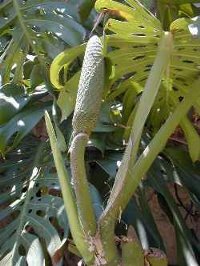 Find out about eating monstera deliciosa as part of a healthy raw food diet.